Audi earlier this month revealed its Tesla-fighting 2019 e-tron, an electric midsize SUV Audi expects to deliver to customers in the second quarter of next year. 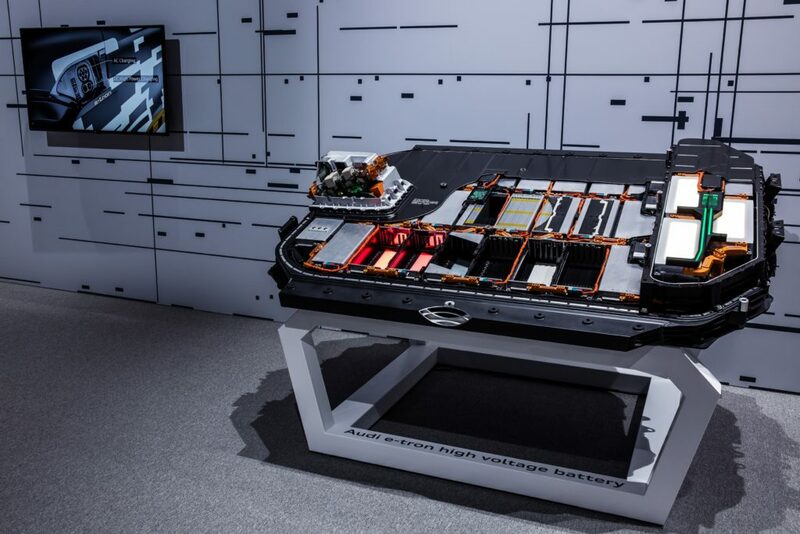 Audi says the car can obtain as much as an 80 percent charge in 30 minutes at certain high-speed charging stations, which appears to be possible at the nearly 500 mentioned earlier. Electrify America plans to roll out nearly 950 fast-chargers as part of a $2 billion project ending in 2027. The OEM will also partner with Amazon to sell home equipment and installations for charging one’s Audi more efficiently. As the typical trip in a vehicle is actually just a few miles (for example, your daily commute, or an errand), it’s more likely you’re probably just going to be topping off the battery on either a 240-volt or a 120-volt outlet at your house than running out to a charging station. 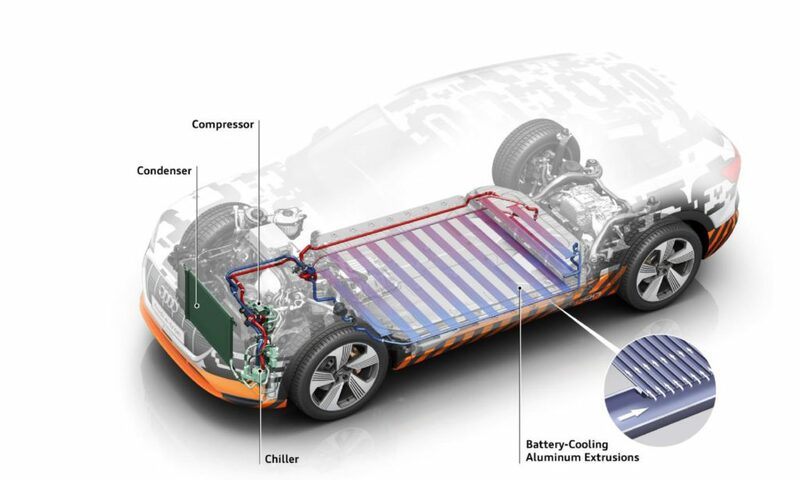 A 240-volt outlet can fill up the “tank” overnight, according to Audi. These factors combined address the “range anxiety” issue, and the fact that it’s a luxury vehicle means consumers are less likely to care about the extra cost typically associated with the sticker price on an electric vehicle. Audi also touts its ability to support the SUV. “As an electric SUV that includes integrated digital tools, in-home charging solutions, and the support of Audi of America’s 303 dealer partners —e-tron owners can confidently choose electric performance knowing they have the support of a full Audi ecosystem,” Audi wrote in a news release. Audi hasn’t yet responded to an inquiry about whether all of its certified body shops must be equipped to fix the e-tron or if it would create a subset of certified repairers for the vehicle. 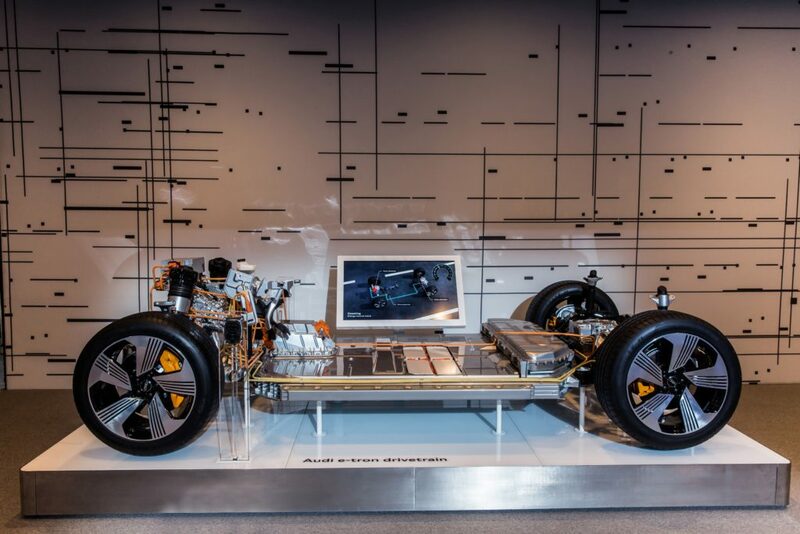 Now that we’ve addressed the key questions skeptics will likely have about consumer adoption of any new electric vehicle, let’s move on to the body repair-related stuff you really care about. 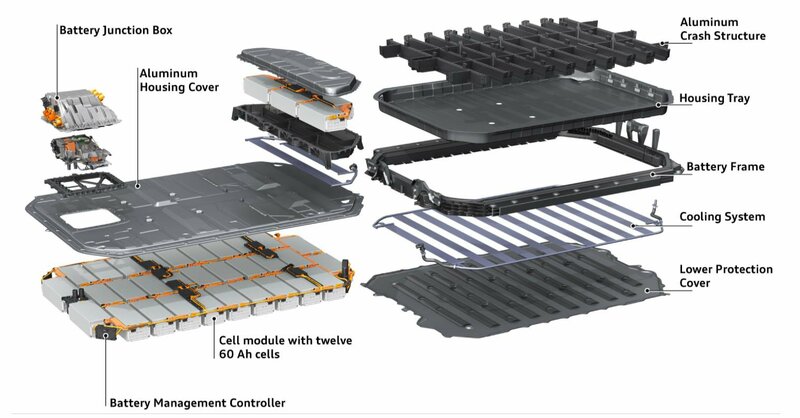 The battery assembly also has “intricate crash structures,” according to Audi. 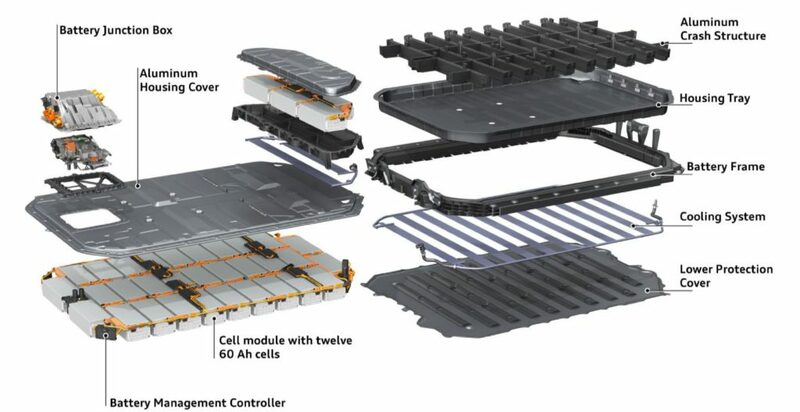 Audi bolted the 1,543.2-pound battery assembly to the vehicle underbody at 35 points. “This increases the torsional rigidity of the body, which in turn integrates numerous aluminum parts such as the floor plate in the rear structure,” Audi wrote. Not only does the floor plate contribute to aerodynamics by being part of the fully clad underbody, but the plate’s “screw connection points are recessed to deliberately create minor vortices so that the air flows even better.” This is an interesting engineering detail, and we’d be curious if more OEMs adopt such tricks in the future. Minute vehicle changes can actually have a significant role on how the elements move around a vehicle. The doors, hood and tailgate are also aluminum, according to Audi. The passenger cage itself “features components made from heat-formed ultra-high-strength steel,” according to Audi. At the sculptural rear, the long roof spoiler and wide diffuser accentuate the sporty look. 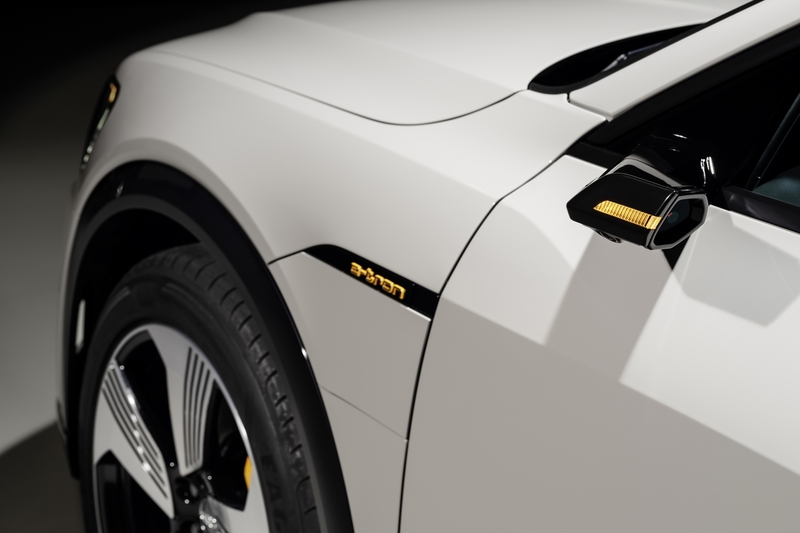 … Meanwhile the four cross-slats in the diffuser draw attention to the absence of tailpipes, another reference to the fully electric drive. Shops will also note a variety of other external features, including a “regulated cooling air inlet with ducts for cooling the front brakes” and a standard panoramic sunroof. LED headlights and taillights are standard, and a light strip connects the taillights. 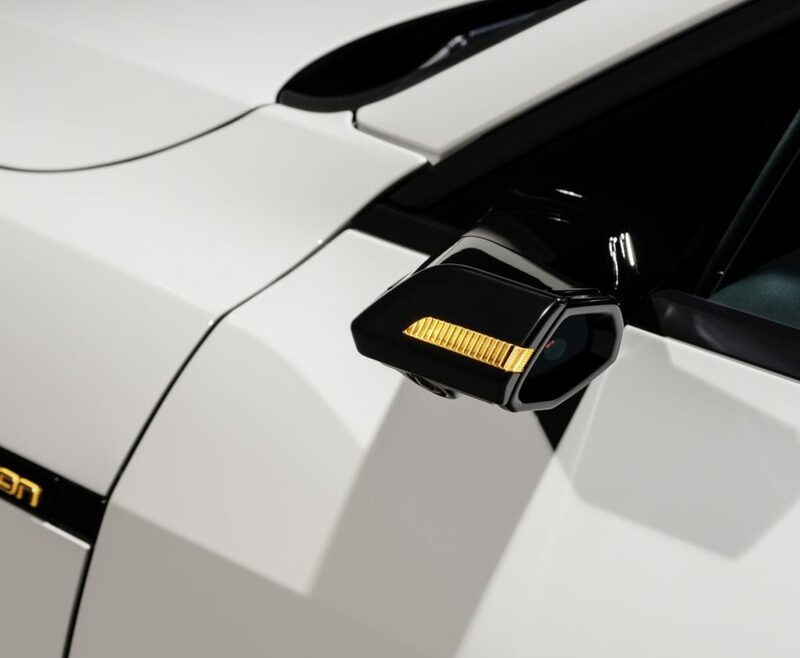 The European version also has optional “virtual exterior mirrors,” which replace mirrors with thin cameras for greater aerodynamics. If American regulators approve the concept, you might see these here someday too. Wheels: You might have to use OEM wheels. “The standard-fit 20-inch wheels are aerodynamically optimized and fitted with 255/50 tires,” Audi wrote. “These are especially engineered for their ultralow rolling resistance. Heat and energy management: A standard heat pump “uses the waste heat from the electrical components – up to 3 kW of the actual power loss are used for cabin heating and air conditioning as well as cooling the electric motor. 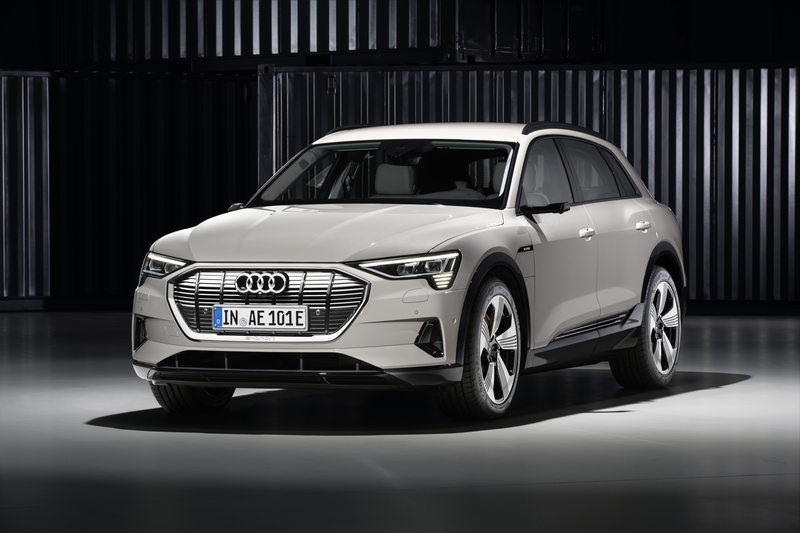 ” It can actually provide up to 10 percent of the e-tron’s range depending on external conditions. The sensory system of the vehicle does more than protect the driver. The vehicle can take data from the radar and camera visuals and pair them with navigation data to tell you when to take your foot off the gas. The idea is that rather than you reacting too late and slowing abruptly to whatever speed you’d need to reach, the AI anticipates this necessary deceleration and coaches you to slow more gradually, thereby producing energy to recharge the battery. Suspension: Various driving modes alter the suspension’s height by up to 3 inches. “Especially on long journeys, a lower ride height improves the air flow around the body, thus helping to increase range,” Audi wrote. An offroad mode hikes the car up 1.4 inches from standard, and an additional “Raise” option boosts it up another 0.6 inches. Windshields: The top-tier Prestige trim has a head-up display projecting data onto the windshield and acoustic dual-pane windows on the front driver and passenger seats. ADAS: An optional Driver Assistance Package has what Audi calls “adaptive cruise assist,” which sounds incredibly smart, equivalent to if not more capable than Tesla’s Autopilot but probably carrying a more mundane name so you don’t think you can zone out. The system at the heart of the optional Driver Assistance Package is adaptive cruise assist, which comfortably provides longitudinal and lateral control in traffic jams or at highway speeds. It supports the driver with accelerating, braking, maintaining speed, keeping distance. The system can detect lane markings, roadside structures, vehicles in adjacent lanes and vehicles driving ahead. In construction zones, the Audi e-tron automatically adapts its speed to the traffic situation, taking into account the speed limit. If the lane is too narrow to allow side-by-side driving, adaptive cruise assist enables offset driving through narrow stretches. 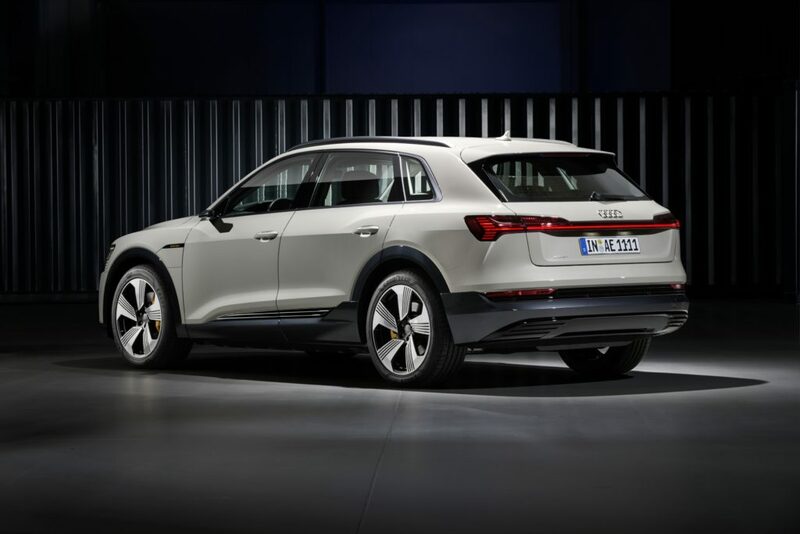 In conjunction with efficiency assist it predictively slows down and accelerates the Audi e-tron based on its evaluation of sensor and navigation data as well as road signs. It automatically adjusts to the current speed limit, reduces the speed before corners, during turning and on roundabouts. The system can maintain a driving style that reflects the driving program selected – from every day to sporty. The capabilities of this system makes one wonder if the OEM would upgrade the technology over the air to a more advanced form of autonomy. Audi, after all, had once announced the 2018 A8 would be able to drive itself under certain conditions — with the motorist truly able to take their hands off the wheel. 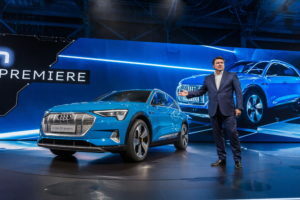 The OEM ultimately put its plans to introduce “traffic jam pilot” in the U.S. on hold, but one wonders if it could at some point activate such a capability for the e-tron as well.